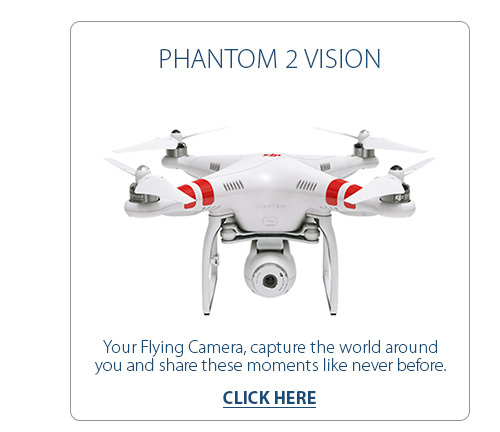 The Phantom 2 Vision Quadcopter with Integrated FPV Camera is the second generation of quad-rotor RC helicopter from DJI and features their own 14 megapixel wireless HD FPV camera, giving you first-person view (FPV) experience right out of the box. With a larger battery and improved prop design, flying time lasts to up to 25 minutes, compared to around 14 minutes on the original DJI Phantom Quadcopter. During flight, the camera is stabilized on the tilt axis. Tilt control can be remotely controlled through the App making it simple and easy to use. A lens profile relaesed by Adobe for DJI Phantom 2 Vision's camera can be used to remove lens distortion. Adobe Lens Profile is available in the latest versions of Adobe Lightroom, Photoshop and Creative Cloud. Camera settings including Picture Quality, ISO, Exposure Compensation, White Balance, and RAW or JPEG capture can be adjusted through the Vision app. Beam photos and videos from the Vision straight to your phone using Wi-Fi. No PC required. Copyright © 1997-2012 PASSERVICE. (ABN 58 753 906 781) All rights reserved.